alert: Videos might not be supported in all browsers Consider changing to Google Chrome Or Opera in that case. Description: Arvind Kumar Choudhary is widowed, respectable and wealthy businessman, who lives with his only son, Arun, in a palatial house. He re-marries another woman, Sujata, who is a widow, with two daughters, Veena and Seema. Arun does not respect her and refuses to even speak with her. Arun meets Neema Deshmukh and both of fall in love. With approval of their respective families they get married. Then things start to slide financially for the Choudharys when Arun accidentally breaks a valuable diamond while daydreaming about Neema; the Choudharys lose all their savings, building, vehicles and property, move to a shanty apartment, and Arvind passes away. Arun takes over the reins of this family, and starts talking to his step-mother. Neema gives birth to a baby boy and they name him Abhinandan. Misunderstandings occur between Sujata and Neema, they escalate, fueled by some gossip from neighboring women, leading to arguments between Arun and her. Then one day, Mahendra, Neema's brother sees Arun with another woman, informs Neema, who quickly packs her things and leaves Arun. She goes to the courts, gets the custody of Abhinandan, and Arun is only allowed a weekly 4 - PM visit, which he is unhappy with, and decides to wait until his son is 14 and will then take him home. 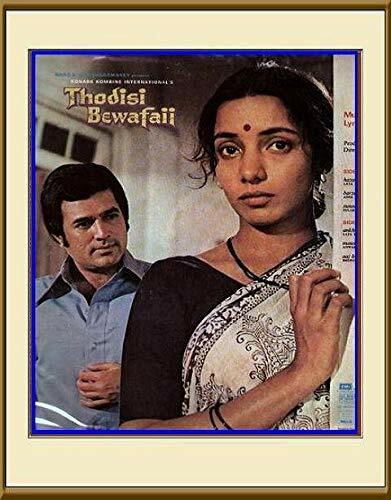 Then Neema's father is arrested by the Anti-Corruption Bureau accepting a huge bribe from Mr. Lalwani; Mahendra asks Neema to sell her jewelery so that he can immigrate to Germany, she does so, he leaves, never to be heard from again. Neema's dad, Abhinandan and she re-locate to Nasik to live with Narendra, Neema's second brother and his wife. This is where her son grows up, curious to know about his dad. Years later when he turns 14, Arun shows up on her doorstep - only to be told that their son has run away from home. An enraged Arun must now find if Neema is telling the truth or hiding their son someplace else.Arvind Kumar Choudhary is widowed, respectable and wealthy businessman, who lives with his only son, Arun, in a palatial house. He re-marries another woman, Sujata, who is a widow, with two daughters, Veena and Seema. Arun does not respect her and refuses to even speak with her. Arun meets Neema Deshmukh and both of fall in love. With approval of their respective families they get married. Then things start to slide financially for the Choudharys when Arun accidentally breaks a valuable diamond while daydreaming about Neema; the Choudharys lose all their savings, building, vehicles and property, move to a shanty apartment, and Arvind passes away. Arun takes over the reins of this family, and starts talking to his step-mother. Neema gives birth to a baby boy and they name him Abhinandan. Misunderstandings occur between Sujata and Neema, they escalate, fueled by some gossip from neighboring women, leading to arguments between Arun and her. Then one day, Mahendra, Neema's brother sees Arun with another woman, informs Neema, who quickly packs her things and leaves Arun. She goes to the courts, gets the custody of Abhinandan, and Arun is only allowed a weekly 4 - PM visit, which he is unhappy with, and decides to wait until his son is 14 and will then take him home. Then Neema's father is arrested by the Anti-Corruption Bureau accepting a huge bribe from Mr. Lalwani; Mahendra asks Neema to sell her jewelery so that he can immigrate to Germany, she does so, he leaves, never to be heard from again. Neema's dad, Abhinandan and she re-locate to Nasik to live with Narendra, Neema's second brother and his wife. This is where her son grows up, curious to know about his dad. Years later when he turns 14, Arun shows up on her doorstep - only to be told that their son has run away from home. An enraged Arun must now find if Neema is telling the truth or hiding their son someplace else.